"The idea was taken up by J. Brockhouse & Co. Ltd. and the Executive Engineer of the Company,. Mr. R. E. Hagley, produced designs for a locomotive, vehicles, and track. 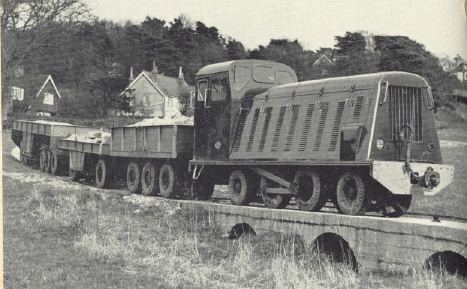 The system was called the "Uniline" and a demonstration was given at Mayfield in Sussex, where the experimental track was built, on 6 Apri1 1951. The track, as in the Indian trials, was some 3 ft. wide and the stock had a similar guiding system with vertical rollers at front and rear. All vehicles were fitted with pneumatic tyres. In the course of the demonstration on the half-mile track loads of 21 tons were hauled up a gradient of 1 in 15 at a speed of 41/2 m.p.h. Drawings lent to us by J. Brockhouse & Co. Ltd. show the locomotive used to have been, in railway parlance, a 2-4-2 with a 90-b.h.p. 4-cyl. diesel engine. It was 15 ft. 9 in. over the buffers, which were single and central, and the wheelbase was 10 ft; the leading and trailing wheels had tyres 24 in. x 7 in. and the driving wheel tyres were 27 in. x 7 in. There were four guide roller sets arranged in pairs in front of and behind the leading and trailing wheels. The total weight in working order was 5 tons. The primary gearbox was a Meadow's type 10 4-speed box with clutch and provision for power take-off. It was not fitted with a reverse gear. The secondary gearbox was a "Brockhouse" single speed and reverse gearbox provided with a jackshaft and coupling rod final drive. The two gearboxes were connected by a flexible coupling. All tyres were inflated at a pressure of 90 p.s.i. The locomotive was designed to take curves of 50-ft. radius. Compensated brakes were fitted to each axle and an air compressor, reservoir, and driver's brake valve were provided to allow continuous automatic brakes to be used on the train vehicles. The drawings show 3-ton vehicles with four wheels, 41/2-ton vehicles with six, 6-ton vehicles with eight, and 10-ton vehicles with two six-wheel bogies. The calculated performance figures with the locomotive mentioned showed that up to 25 m.p.h. might be attained with a suitable load and in first gear a load of 126 tons might be hauled on the level. Mr. Hagley said at the demonstration that the system had not been designed to compete with existing road or rail transport systems, but to supplement them…"
This was built in 1922, at Phyllis Avenue, Peacehaven. 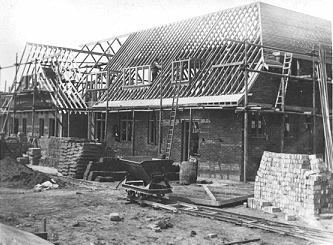 It was a substantial building in a style reminiscent of Lutyens country houses with a large sunken garden on the west side. This photo shows the side facing Phyllis Avenue. Possibly the railway was used to bring chalk from the sunken garden to level the area round the back of the building. There appears to be a point on the right on the original photo, so building materials may also have been moved from the adjacent South Coast Road (A259). All traces of this building have gone, destroyed over a Bank Holiday weekend whilst in the process of being listed! This is an enlargement of the edge of a rather small print showing a cross-channel steamer entering the harbour. On the left is the end of a standard gauge siding with a loading ramp beside it. In the centre of the picture are two skips, presumably end-tipping types. Could the shape at the bottom of the ramp be some sort of petrol locomotive? 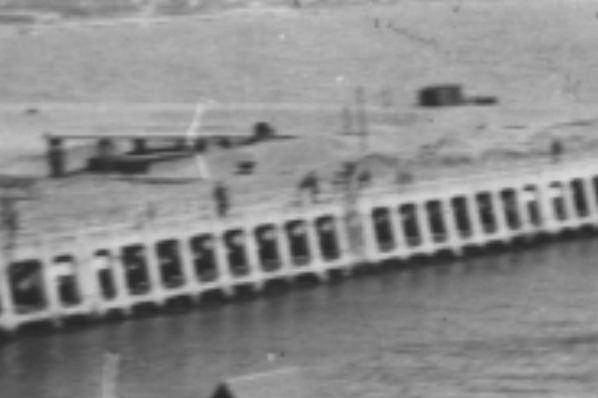 This is an aerial view of the same area, also 1920s/30s, showing the ramp.